A team representing Kverneland, Versatile and “traction” – the farm machinery magazine for profis – succeeded to plough 24 hours non-stop following the best practice with one full tank only. From October 26th noon, until October 27th at the same time, the combination of a Versatile 550 DeltaTrack belt tractor and a 12 furrow Kverneland PW Variomat, with Packomat, completed an overall acreage of 103,5 hectares. Working depth had been adjusted to 26 cm on medium-heavy soils (loamy to clayey sand). “Versatile DeltaTrack can utilize 1.700 l of fuel storage and is therefore one of the tractors with the biggest tank capacity on the market”, explains André Duenk, Product Specialist at Stoevelaar Machinery BV, the Dutch importer of Versatile. “Based on this, standstills for refueling are minimized and several shifts can be worked in a row. In addition, the Tier 4i homologated Cummins QSX15 engine runs very efficiently as its maximum torque is available at fairly low 1.400 rpm. 550 hp nominal and 591 hp maximum in combination with 2.779 Nm maximum torque ensure sufficient power reserves under all conditions”. The Kverneland PW 100 Variomat semi-mounted reversible plough has been equipped with 12 pairs of body 28, maize skimmers and two Packomat units. “Kverneland focuses on efficient ploughing for the farmer”, says Dominik Haselhorst, Manager Marketing and Product Management at Kverneland Group. “Hence, this experiment has been a good opportunity to prove that our ploughs are easy to pull“. Haselhorst highlights three main aspects of the plough: “The entire implement is operated via ISOBUS from the tractor cabin. In addition to Kverneland Group Operations Norway As, Plogfabrikkvegen 1, 4353 Klepp, Norway ensuring smooth turning sequences on the headland, this also relieves the operator during long working days. The plough centerpiece is body N° 28 – providing wide and empty furrows as well as burying organic matter properly. This type of universal plough body generates low pulling forces. In addition to a quality ploughing, there has been a special attention given to levelling and re-compacting throughout the entire soil depth with the plough integrated Packomat. Thanks to this, a seedbed is nearly prepared in one pass”. Conversely to previous official world record attempts, maximum acreage was not the objective of this event. Efficient work according to best practice was given more importance. “The results shall immediately be clear for every farmer”, explains “traction” – chief editor Matthias Mumme. “For this reason, we arranged our action in the field strictly according to the demands of APH e.G. Hinsdorf, the farm site in Saxony-Anhalt”. After harvesting, corn stubble and residues had just been mulched once. “We did neither look for extremely light conditions – usually chosen for record ploughing – nor had the soil been worked with a cultivator or disc harrow prior to ploughing. Also the headlands had not been laid out extraordinary wide”, says Mumme. “Due to the previous long dry spell and wet layer of residues on top of the soil, conditions have been demanding. Not least, compact headlands resulted in comparably long reversing sequences. 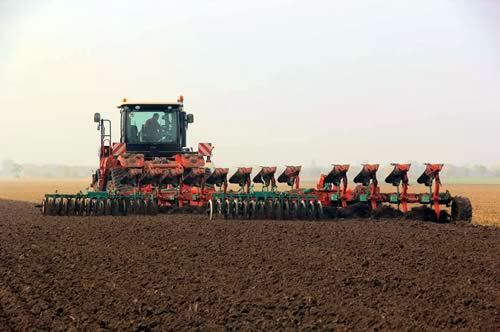 The 24-hour ploughing has been carried out in two fields of APH e.G. Hinsdorf in Quellendorf, Saxony-Anhalt. One of the plots was of triangular shape and caused a higher degree of unproductive headland driving. Despite the expected reduced traction due to the mulch layer, the team of Kverneland, Versatile and “traction” decided to use the PW 100 Variomat driving On-land. “Four, 76 cm wide Camoplast rubber tracks grant extensive gearing between tractor and soil under nearly all conditions”. This reduced slippage to a minimum, according to André Deunk, Stoevelaar company. Both Auto-steering of the tractor and recording of the ploughed acreage have been measured by using a FarmRTK-guidance system by AXIO-NET. Metering the fuel tank of the Versatile 550 DeltaTrack after ploughing showed an overall diesel consumption of 1.664 l, equivalent to about 16 l per hectare. “Based on current conditions, we are very satisfied with this value”, Dominik Haselhorst summarizes. “The soil has been quite tricky to work. The plots were partly sloped and 26 cm working depth has even been slightly deeper than usually on this farm”. All in all, the 12 furrow PW 100 Variomat offered a working width of 6,0 m – having been pulled by the Versatile 550 DeltaTrack with an average speed of 9,3 km/h. Matthias Mumme, chief editor of ”traction“, draws an overall positive conclusion: “All three team members, namely Kverneland, Versatile and ‘traction’ did an excellent job. The plough left a levelled and re-compacted, well-crumbled seedbed without residues – and also working with the Versatile DeltaTrack has been very convincing. Its even high torque throughout a wide range of speeds is impressive and allows the engine to be operated at lower rpm rates even under full load in order to save fuel”. He continues: “Special thanks to the people involved from APH e.G. Hinsdorf, who made this project possible by means of providing fields and manpower”.